Lepidodactylus lugubris are small geckos of around snout-vent length (SVL) 45mm, although the maximum SVL can vary slightly according to the population from which the animal comes. The tail is moderately long and normally just over 100% of SVL. The skin is smooth. Their backs and tails have a ground color of pale creamy-fawn with a variegated dark brown/beige "overlapping" zigzag pattern. Their undersides are always beige and sometimes speckled. These geckos are parthenogenetic which means that females reproduce independently of a male. Consequently populations are generally all-female. Lepidodactylus lugubris is one of approximately 25 species of Lepidodactylus and is a member of Lepidodactylus Group III (Brown and Parker 1977). Lepidodactylus lugubris are extremely widespread being found right across the Pacific region. They can also be found in the Hawaiian Islands as well as Cocos (Keeling) Island and Queensland, Australia, Central and South America and beyond. As can be guessed at by its enormous range Lepidodactylus lugubris is a very adaptable gecko that can thrive in a variety of habitats. In different geographic locations they have been found in mangrove trees, on bare rocks near seashores, in the leaf axils of palms, behind the bark of trees and in human habitations. It is a nocturnal species. Lepidodactylus lugubris do well in small groups. I keep up to six in a ten-gallon vivarium and this affords the opportunity to witness social interactions amongst the group. Whilst a dominance hierarchy can occur and fighting will ensue this is not as severe as can happen when males of some gecko species are kept together. However, if space is too limited and hideouts too scarce I have witnessed some severe aggression with posturing (arching back) and attacking of cage mates. I have even observed a specimen upside down on the top screen biting another gecko, which was literally dangling from the attacker's mouth! Generally though, given adequate space and cage furnishing this is a relatively sociable species and any battle wounds heal with time. Keep these geckos at 70F minimum with a somewhat warmer temperature during late Spring and Summer. They do not seem to require a temperature drop at night. My personal rule of thumb is that a warm Lepidodactylus lugubris is an active Lepidodactylus lugubris! Fresh water should be available in the vivarium at all times. I use a peat moss substrate and live potted plants to assist in increasing the humidity. Generously mist at least once daily, more often if temperatures exceed 80F. Periodically dampen the substrate but note that the environment should "dry out" by the day's end. Varied cage furniture adds to your geckos' comfort, increases their activity, and adds interest from a human perspective. Provide rocks, driftwood, plastic aquarium foliage, potted plants (e.g. Pothos, Sanseveria sp. ), and ample hiding places. Aquarium vines can be hung upside down with small suction cup hooks. A well-fitted fine mesh screen for the top of the vivarium is a must. These geckos are escape artists! Shake crickets (1/4", up to 1/2"), vestigial-winged Drosophila, waxworm larvae, and other live food with Rep-Cal's phosphorus-free, ultrafine calcium with vitamin D3 powder and/or Miner-all "I" powder. As an additional calcium supplement, you can also feed these geckos shaved cuttlebone. Lepidodactylus lugubris will eat cuttlebone directly from a plastic lid. As a second natural calcium supplement, be sure to "recycle" the empty eggs after the young have hatched. These geckos enjoy baby foods (banana, peach, tropical fruit, and either chicken or turkey) once a week or so. You can mix in the vitamins and place that mixture on a plastic lid. Balance the amount of vitamin A judiciously, because vitamin A toxicity can be a problem. To reduce decay from cricket carcasses inside the tank, some gecko-keepers place crickets in a separate container within the vivarium. These geckos will readily climb into this container for their meals. If you try this feeding technique a word of caution; sometimes excess powder falls off the crickets into the container, "sticks" to the geckos' toes and makes the geckos temporarily unable to climb out! Contrary to what Henkel and Schmidt (1995) have written Lepidodactylus lugubris are cannibalistic. They will consume the yolk or the embryo if the egg happens to crack prematurely. They will also pursue and consume unlucky hatchlings. It is recommended that hatchlings are removed as soon as they are discovered within the parent vivarium. Tails regenerate if bitten off. Fingers and toes will not regenerate. If skin remains after shedding, your gecko will need some assistance in removing the skin or digits may be lost. Soak your gecko in tepid water, and then carefully remove loosened skin with tweezers. Peat moss used as a substrate increases the humidity when sprayed, thereby lessening incomplete sheds. Seizures may result if calcium and vitamin supplementation is less than the optimum. Kinked tails may be indicative of excess vitamin A. These attractive animals do not seem to mind being handled. Longevity seems to be in their genes - I have one specimen that is 12 1/2 years old. At about eight to ten months old Lepidodactylus lugubris become sexually mature. They generally lay two eggs, but occasionally one egg, per clutch and they are prolific, communal egg-layers! They will "glue" their hard-shelled eggs almost anywhere. Once laid, the eggs are very difficult to remove without cracking. I suggest placing a section of choya wood, bamboo, or plastic aquarium foliage in the tank as potential portable egg-laying sites that can be removed, together with eggs, for incubation. Eggs take 60 days or longer to hatch when kept at 70F minimum. Hatchlings measure 35mm from snout to tail tip at birth and are easy to raise. Bauer, A.M. and R.A. Sadlier. 2000. The Herpetofauna of New Caledonia. SSAR. 310pp. De Vosjoli, Philippe. 1994 The Lizard Keeper's Handbook. Advanced Vivarium Systems Inc.; Lakeside, California. 175 pp. Henkel, F-W. and W. Schmidt. 1995 Geckoes: Biology, Husbandry, and Reproduction. Krieger Publishing Company; Malabar, Florida. 237 pp. Seufer, Hermann. 1991. 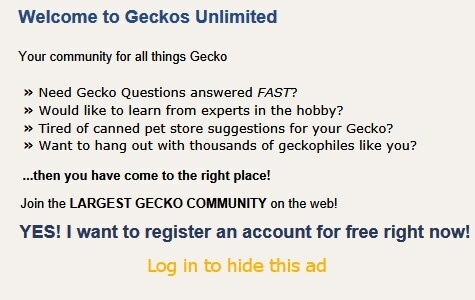 Keeping and Breeding Geckos. T. F. H. Publications, Inc.; Neptune, New Jersey. 191pp. hi do you know anything about how to get the Lepidodactylus angularis I think that’s what kind I have but its similar to lepidodactylus lugubris. I know that once you get them to they can be prolific egg layers but I’m not sure how to get them to do so. I guess my question is should I condition the tank in any way??? Now, instead of Rep-Cal's Calcium with D3 (way too much vitamin D3), I lightly dust with Zoo Med's Repti Calcium with D3 at 1 feeding per week. At a second feeding per week lightly dust with Zoo Med's Repti Calcium without D3. Maybe 2x per month also lightly dust with Zoo Med's Reptivite multivitamins without D3. Here's a photo that shows different types of Lepidodactylus lugubris. Last edited by Elizabeth Freer; 01-29-2018 at 12:20 PM.